The last weekend of the first month of 2011 worked well for us at three of four venues and our watch lists have been productive, complete with repeat performances. In Paris, however, at the big show at Vincennes, the favorite, Ready Cash, was dominant over the second choice. This ignited one of the lowest combos for the event in recent memory. At the Meadowlands on Jan. 29, among our three Presidential Final contenders, our second choice won, paying $10.60. Our 8-1 shot, last year’s champ, Blatantly Good, was not at his best, finishing seventh at 8-1 (an entry for trainer Don Campbell with Real Celebration, the shocking winner of the first leg). When Summer Camp tanked in the Clyde Hirt Final, both of our choices over him completed the $27.60 exacta. Meirs Hanover won, paying $6.40, with Sniper Seelster second. No one could beat St Elmo Hero in the Complex Final as he rolled out his 23rd-straight victory, paying $2.40. We’ll keep an eye on cracking that code, because “Elmo” will have to begin facing much stronger horses as the season ensues. At Cal Expo we made a bit of noise, even when one of our Pick-4 singles scratched. In Race 14 we warned of a big price, awaited win from Awesome Deal N, with Anelectricmachine right behind him. That is how it resulted, with a $19.60 win price for the former and a $30.90 exacta for the combo. In the first leg of the non-takeout late Pick 4, Mad River Hanover scratched. Race 12 was a stinker with Code Blue and Elegant Emma out of it and Race 13’s single, Exit Hanover, broke at the gate and was never in the race. We encourage wagering on the individual contenders when the price is right, so if you caught Race 14 to win and/or as an exotic, you sensationalized brilliantly on a Pick-4 ticket gone awry. Also on Saturday night in Sacramento, Snowmurs won for us, paying $10.40 and a repeater from our watch list, Sandra Hotspur, returned to the winners’ circle at a remarkable price of $10.80. The night before, Myra’s Hiho came through as a big choice, paying $3.40. On Friday at Maywood, we gave you three winners: Fox Valley Ruler at $15.80, Prime Minister at $5 and Triggerfish at $3.20. At Northfield that night we were shut out of the top spots. Yonkers Raceway, track publicist Frank Drucker write, rings in the shortest month with longer distances. Beginning Tuesday, Feb. 1, all of Yonkers’ overnight races will be contested at the distance of 1 1/16th miles. This distance remains in effect until further notice. It had been implemented any number of times before but never over a long period. All series and stakes races will remain at the mile distance. Rosecroft Raceway may not be defunct for harness racing, as Penn National Gaming (PNG) became the new owner. 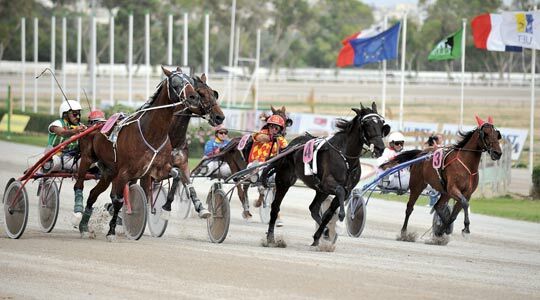 PNG agreed to pay $10.25 million in cash for the harness track in an auction. It previously bought a share in the thoroughbred tracks at Laurel and Pimlico. 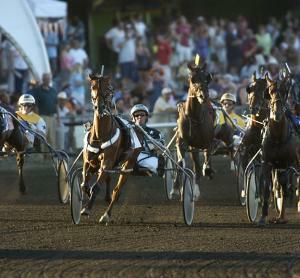 Rosecroft has struggled for decades to stay om business. Now, PNG plans to work with standardbred horse owners and the Maryland Racing Commission to develop a plan to resume live racing at Rosecroft. COMMENT(S): It’s with layoff starters like TAP FOR LUCK that trainer Todd Pletcher excels — a classy horse dropping in class. Tap For Luck looked spectacular winning her lifetime bow with a 102 Equibase speed figure (today’s par is 93) and -3 late speed ration (LSR). She then tried graded company in a trio of routes, finishing second in the Grade 3 Tempted. Today, she’s back sprinting, which I think suits her better (her dam has a 6.20 Dosage Index). BECAUSE I LIKE possesses the best (lowest) early speed rations (ESRs) in the field and should be tighter in her second start off the shelf. FUNNY SUNNY ran OK in her debut race at Hoosier Downs. BET(S): WIN on 6 at odds of 2-1 or greater. COMMENT(S): PERFORMING looks best on paper, but she has a tendency to hang, making her very vulnerable at a short price. BA BA’S BUNCH recorded an excellent +2 LSR in a Dec. 2 win off of a long layoff and then bid and hung last time. With improvement, she could prove to be dangerous at a price. I DREAMT I WAS ran very well last time (85 Equibase speed figure, -1 LSR); she fits. BET(S): WIN on 1 (at odds of 12-1 or greater) and/or WIN on 2 (at odds of 5-1 or greater) and/or PLACE on 8 (at odds of 7-2 or greater). COMMENT(S): DANCINGINHERDREAM’s effort in the Grade 3 Pocahontas was simply awesome, earning the daughter of Tapit a -10 ESR and -7 LSR. Obviously, she has a ton of ability, though I’m concerned about the layoff (91 days). 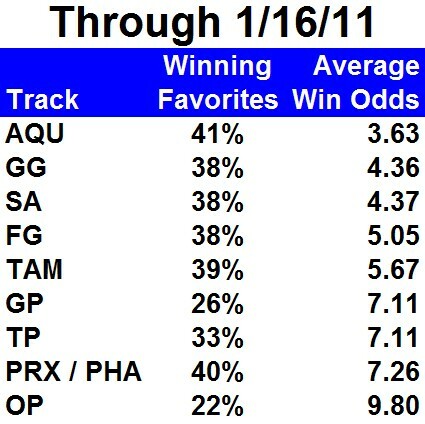 THIRD CHANCE improved significantly last time, garnering a 98 Equibase speed figure (today’s par is 100) and a -9 LSR. More importantly, she’s got enough early lick to contend early. R HEAT LIGHTNING is another that appears to be improving and her recent workouts look encouraging. BET(S): WIN on 6 at odds of 5-2 or greater. COMMENT(S): BLACK N BEAUTY could not have looked more impressive in his latest and my pace figures back up the strong visual impression I got from that race. The Canadian-bred son of Devil His Due earned a -10 ESR and -5 LSR in winning that N1X allowance affair on Jan. 7. On the negative side, he was just a $2,500 yearling purchase, indicating some potential physical issues, and he’ll be tested for class today, but the early returns have been good. MAJOR GAIN broke his maiden in a Grade 3 event at Arlington Park and raced well in his dirt debut on Nov. 27; he could be overlooked. LEAVE OF ABSENCE recorded a woeful -20 LSR last time, but his previous effort was good enough to win this. BET(S): WIN/PLACE on 4 at odds of 7-2 or greater. 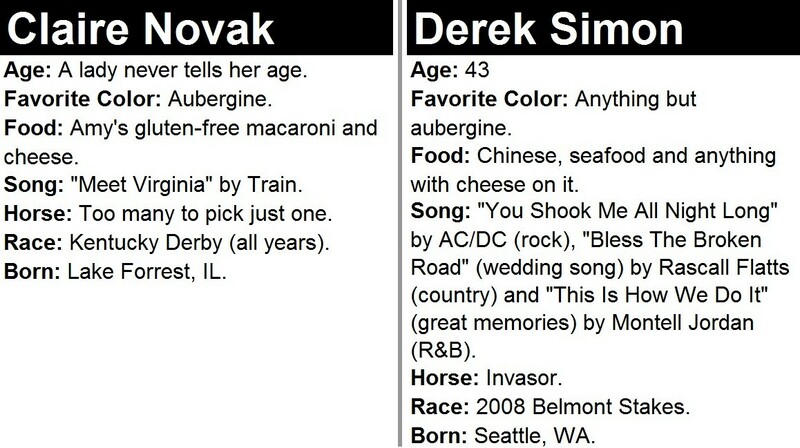 COMMENT(S): SWITCH is the real deal, but I wasn’t thrilled with her last race and would try to beat her in the show pool. COMMENT(S): In a very contentious race, I’m looking for WILDCAT HEIRESS to lead from flag fall to finish. Her trainer, Tevis McCauley, is very good with sprinters and, despite the lack of recorded works, I’m reasonably confident he has Wildcat Heiress ready to roll. I thought/think AMEN HALLELUJAH was among the most overrated sophomore fillies last year — right there with Devil May Care — but this is a new year and today’s distance is much, much better. Her workouts have been strong and progressive and I expect a good showing today, albeit at a short price. NORTH RODEO is not the third-best horse in this event, but her pace figures are improving and I think she stands a shot of hitting the board at an inflated price. COMMENT(S): COST OF FREEDOM is clearly the one to beat, however, he is attempting the dirt for just the second time in his career and, at the age of eight, is coming off of a lifetime-best 115 Equibase speed figure earned 49 days ago at Hollywood Park. If you’re seeking value in the race — and if you’re not, you should be — look no further than APRIORITY, who is a perfect three-for-three on the dirt and has solid speed and pace figures. EXCESSIVE PASSION has been training like he might have improved this winter and lures Russell Baze to ride. BET(S): WIN on 7 at odds of 8-1 or greater. SHOW on 7 (in case there is a negative show pool). COMMENT(S): I really like what trainer Patrick Gallagher has done in attempting to prepare SOUL CANDY for this race, as he’s trained him almost exclusively on the grass since his last try on the Cushion Track at Hollywood Park. The son of Birdonthewire is improving and should offer value in this spot. JERANIMO exploded through a hole on the rail to win last time and has a ton of talent. THE USUAL Q. T. should improve off of his latest. BET(S): WIN on 4 at odds of 8-1 or greater. Much has been written about Muhammad Ali’s epic battle with George Foreman on Oct. 30, 1974. Dubbed the “Rumble in the Jungle,” the heavyweight boxing title bout in Kinshasa, Zaire (now the Democratic Republic of the Congo) helped launch Don King's career as a professional boxing promoter (I guess Brett Michaels was right: every rose does have its thorns). I thought of this masterwork the other day, as I downed a cupful of raw Cadbury eggs on my way to the meat market, otherwise known as Bally Total Fitness (I couldn’t find an actual meat locker in my area), to train for an upcoming verbal sparring session with Claire Novak. Who is Claire Novak, some may ask, and why am I debating her? Well, Ms. Novak is an award-winning journalist who once wrote for Bloodhorse Magazine and, now, regularly lifts her pen for ESPN. Recently, she received an e-mail from a guy named Tom De Martini, who chastised her for not betting on the races she covers. Her public response, “Love of the game,” which appeared on the ESPN Website on Saturday, is the driving force behind our little tête-à-tête. While I’m generally not a fan of angry missives (especially those accompanied by a brick and the sound of breaking glass — damn in-laws, I told them we’d return the casserole dish this weekend), I have to admit I understood and even sympathized with where Mr. De Martini was coming from. Speaking of betting, a couple of weeks ago, I challenged both public and private horserace handicappers to do what I do and prove their mettle at the windows by allowing me to record and track at least some of their picks on a weekly basis. My goal behind this challenge was to, hopefully, show “newbies” as well as potential “newbies” that the races can, indeed, be beaten —in a variety of ways. Sadly, my casting call was met with about the same amount of enthusiasm as a plea for photographic evidence at a Bigfoot Convention (yeah, they actually have those). Nonetheless, one brave soul did step forward and I’m hoping others will follow. Rationale: The #4 is faster out of the gate than the #3 and is in-form. Rationale: Ben Perkins can crank a horse up and this gal has good works; probable loose leader. Rationale: #2 has typical comeback work pattern for trainer Kenny McPeek and may have value in talented field. The tandem of McPeek and jockey Julien Leparoux hit at a 22% clip. Rationale: #9 may have been a short horse last time and should be fitter. Plus, the #9 is a class standout and might be the quality speed too. Total Expenditure: 83 units (a unit is simply one’s base bet). What is widely considered to be "the most prestigious harness race in the world", TwinSpires is very happy to be able to offer the Prix d'Amérique. The race is this Sunday, January 30th. The Prix d'Amérique will go off as the first race on the card . We will offer a total of six races from the overall card. The Prix d'Amérique website (in French) can be found here. More info will be posted on our Facebook Page and over on TwinSpires.com. 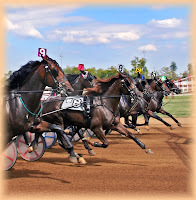 Our weekly eNews will also have complete race and wagering info. Last Call for Vegas - Thank You and Congratulations to Our 29 winners! The TwinSpires "Last Call for Vegas" online tournament concluded Saturday evening, and we would like to congratulate Mike Midland of Chicago, IL for taking home the first place prize of a berth into the 2011 Horse Player World Series at The Orleans Hotel and Casino in Las Vegas, $1,150 cash and four-night hotel stay! Mike's $103.80 cumulative bankroll from the Fair Grounds' 10 contest races was one dollar best over the next competitor, Daniel Pastaleniec. Chris Larmey finished third with a $99.20 bankroll.....read the full article here. COMMENTS: This doesn’t look like a great betting race, barring something crazy, although I do think the top two morning line favorites should probably be reversed. EARLY RETURN has great tactical speed and trainer Stephen Margolis is sticking with a familiar and successful work pattern coming into today’s race; rates the edge. SWEETSOUTHERNMOON has a 12-3-5-3 ledger in his races on the dirt and should be closing late. MAMBO GALLIANO loves Fair Grounds and fits very well here, but I’m a bit troubled by the 58-day respite after his win in the Thanksgiving Handicap. BET(S): WIN on 4 at odds of 9-5 or greater. COMMENTS: Pace makes this race. DANCE CALLER has won five of six starts when leading after the first call, which seems almost assured in this event, provided jockey Shane Sellers is on the ball. HEAVENLY CHORUS ran great in his 2011 debut, but was claimed from master conditioner Steve Assmussen and faces tougher today. BE ME is in good form. BET(S): WIN on 3 at odds of 8-5 or greater. The Meadowlands’ winter series continue this weekend with the older pacing males taking on the second legs of the Clyde Hirt on Friday, Jan. 21 and the Presidential and Complex on Saturday, Jan. 22. Where it’s even colder, at Woodbine on Saturday, the feature is the $100,000 Willowdale Final, an open for fresh elders, four-year-old pacers. The weekly Cal Expo no-takeout late Pick 4 on Saturday has crowded fields, offering a challenge that could hand the entire pool to a sole ticket, a bold ticket. But the day before, the Peter Lobell Final ($7,025) gathers the legs’ best. And on the bottom of the blog, as usual, there are some horses from our watch lists at various tracks that should be ready to roar. At the Meadowlands on Friday, there are two divisions in the second leg of the Clyde Hirt, with fields of 10 and 11, respectively. After a big win last week, Summer Camp looks to extend his win streak by going three for three. But the horse to watch in the first division is AB’s Attack. He was stuck on the outside for two calls and gave way, finishing sixth, in the previous leg. In the second division, Royal Cam-hall made a big move last week, gaining a total of 10 lengths at 38-1. He is up against likely favorite Highland Rocks, who has finished on the board every start and coming off a win in the first leg. Saturday’s Presidential leg shows 13 stalwart free-for-all horses in two divisions. The first division is to exhibit odds-on choice Bettor Sweet, longshot Schoolkids and River Shark. Schoolkids made a huge move behind cover last week and finished a good fifth, with River Shark holding him off for fourth. The second division features the two first leg winners, Real Celebration and Western Shore, the latter who has gone two for two this year and won in 1:49 last week. Real Celebration went 1:49.2, where he just beat Bettor Sweet. The one to watch here, though, is Mr Saratoga. He comes in from Woodbine where he had to make up 6 lengths last week at the half racing on the outside and finished fifth. The 3 post should give some relief to have a better trip, certainly at juicy odds. This week, The Complex’s second leg is one division with 12 horses, two of which are undefeated. One is St Elmo Hero and the other is McClelland, both undefeated this year, though “Elmo” has never lost, winning 21-straight efforts. The spoiler could be Windsong Gorgeous, who has been runner-up to Elmo all year. Another horse to watch is Ise The By Boy. He was hung last week and gave way. The choices in the conclusion of the Peter Lobell series for older pacers at Cal Expo should be Fakeutu Bluegrass and Vic The Brick, in that order. These two were right on the finish line together in last week’s chapter but “Fakeutu,” trained and driven by Tim Maier, won that battle as she won the other legs. “Vic” has been second to Fakeutu twice after winning three straight at the mile oval. Art Of Arts challenged boldly in last week’s episode and gained enough ground late to have the lead for a bit, before the aforementioned two ate up the remaining mile’s territory. “Arts” got there with a tough first-over trip and could be the spoiler if the top two wrestle or shuffle the lead. WD Cowboy Justice and C’mon Sweet Mariah complete the small field. Woodbine’s Willowbrook Final is a $100,000 open event, featuring the best of the series’ four-year-old pacers over the first few weeks of 2011. It is difficult to predict a strong favorite here; this is a tight, competitive field. However, Art Professor, third in last week’s elim and a powerful winner at this track the week before, could be an overlay here from post 7. The two elim winners, Good Bad Lucky and Sparky Mark, may not be as good as those wins, considering the aforementioned “Professor” and Twin B Warrior, getting a good post and a chance for a better trip than his last two. Malicious has every right to improve at four and is as good as most of these. I must assume that Jackets Required will get decent support, as will the elim winners. The others are all right but would need some incidents to get them home on top of the rest. The no-takeout late Pick 4 at Cal Expo this Saturday looks very competitive. It is again time to take a courageous shot using some of the outsiders that may go off overlays. In the first leg, Race 10, Bullet Tooth Tony is a beaten favorite to Anelectricmachine and should race better this week. Also, you may want to use My Real Love, who closed strongly from an 8-hole start last week at 26-1. In the second leg, Freedomize may be a single, as he was last week when he was interfered with and could only muster finishing sixth. In the third leg, Jet Tet Tet has a good excuse for bombing last week, being hung badly and well meant at 4-1. In a small ticket, you could single him also. In the final leg, Music Of Lodi has a powerful closing punch, as witnessed in last week’s effort at 6-1. This could be the weakest field in the four, so you may want to add the beaten favorite Sandra Hotspur. You could try to hit it with a small investment, using 2,4/2/3,7/3,4. That is a brave and strong $8 ticket. If handicapping the races was as simple as handicapping the handicappers that play the races, gambling on the Sport of Kings would be easy. For example, when Zenyatta was named Horse of the Year at a gathering of racing industry insiders at the Fontainebleau Hotel in Miami Beach, Fla. on Jan. 17, the reaction was about as surprising as discovering that the diapered guy in Nadya Suleman’s new fetish video is Marv Albert. (I’m not claiming that’s the case, mind you, I’m just saying I wouldn’t be shocked or amazed or even mildly startled if it was.) As a value bettor that typically creates my own fair odds line on the races I’m interested in, I figured my chances of reading several rehashes of the “who-did-she-beat” argument over the next few days was about 1-9 — and it turns out that price was grossly inflated. 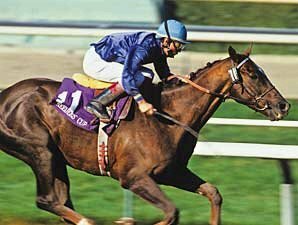 Likewise, I fully expected that after the champion three-year-old filly Blind Luck was defeated in her 2011 debut in the El Encino Stakes, cries of “bias” would fill the air like fireworks on the Fourth of July. Again, I was not disappointed. 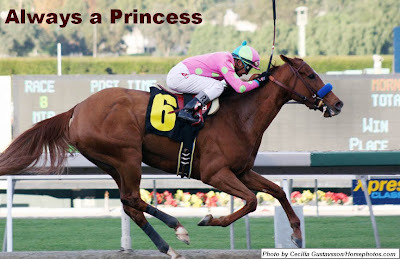 “Speed bias helps Always a Princess foil Blind Luck in El Encino,” screamed Steve Anderson’s headline in the Daily Racing Form. Well, for those not hip to the happenings at the Great Race Place — based on handle numbers, that’s the vast majority — speed has returned to the Arcadia, Cal. facility in a big way. Already, three track records have fallen by the wayside since the opening of the meet on Dec. 26 (including one that was held by the great Spectacular Bid) and every race seems to feature blazing fractions and early leaders that miraculously find a second wind down the stretch. According to Brisnet, 40 percent of the six-furlong races run at Santa Anita through Jan. 16 have been won in wire-to-wire fashion and the average winner is within 1.4 lengths of the lead at the first call. 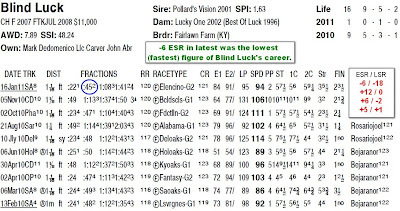 Still, is that really proof of a track bias, one capable of stopping an Eclipse Award-winning filly and “The Sheets” Horse of the Year like Blind Luck? True, a 40 percent gate-to-wire win rate is exceedingly high for a non-bullring (track with a circumference of a mile or more). But it’s worth noting that, like Always a Princess, the majority of these “speed” winners have been well backed at the windows, suggesting that they possessed at least a modicum of past form. In fact, compared to other top tracks, specifically Aqueduct (AQU), Fair Grounds (FG), Golden Gate Fields (GG), Gulfstream Park (GP), Oaklawn Park (OP), Parx Racing (PRX), Tampa Bay Downs (TAM) and Turfway Park (TP), Santa Anita currently ranks third in terms of lowest average win mutuel. 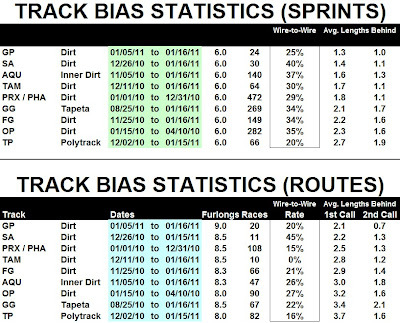 And while some of that is undoubtedly due to the less-than-robust field sizes in California (note that Golden Gate ranks second on the list), the low average odds are still meaningful given that smaller fields typically produce greater pace disparities (witness some of Zenyatta’s triumphs following sundial splits). 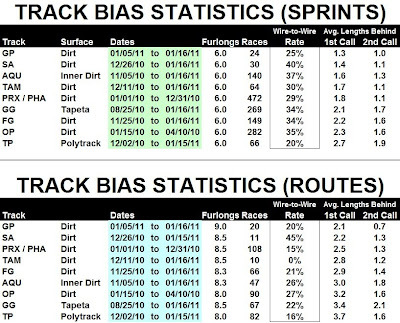 What’s more, if one ranks the tracks above based on the average winner’s trailing margin (if any) at the first call, an interesting picture emerges. 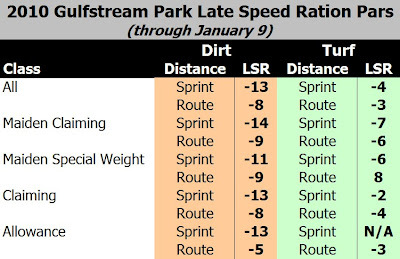 In both sprints and routes, we see that Santa Anita plays second fiddle to Gulfstream Park, a venue that has traditionally been kind to early speedsters, but not one that has garnered blaring headlines and threats of trainer boycotts of late. As for the track costing Blind Luck a victory in the El Encino? I don’t think so. In fact, if you watch that race carefully, you’ll see that Blind Luck was close — maybe too close — early, but fell back on the turn, as the leaders gradually began to pick up the tempo. Then, down the stretch she raced very erratically, while recording a career-low -18 late speed ration (LSR). Frankly, excepting ultra-quick frontrunners, a -18 LSR just isn’t going to cut it in a Grade I route and it makes me very dubious of this gal in her next start… whether she races at Santa Anita or not. Leave it to France to have a harness race with 18 horses going approx. 1.67 miles. Let’s recap the Jan. 14 weekend, which covered high-and-low profile races for the early season, including the series and stakes for older pacers. Once again we nailed some horses that we suggested were ready to go and some of them were overlooked enough to get our money. At Woodbine, where the older pacers that raced best in the Snowshoe elims met in the $60,000 final on Friday, Jan. 14, the horse we thought best went off at 7-2, a reasonable price in this field. Premier Intel won and paid $9.90. We mentioned using Web Cam in exactas and though he raced well at a shocking 11-1, he finished third. Friday at Cal-Expo, Kikiskissinkousin made the most noise, paying $30.60, while Code Blue looked great in the stretch but was passed, finishing in a dead heat as the final element in the trifecta. The Meadowlands has been a bit of a circus so far during its latest incarnation. It seems like a variable track, favoring no one and yet not especially kind to any particular type of pacer or trotter. Some might consider that a level-playing field but I don’t know how to evaluate it correctly. I have to watch more races and make a decision whether it is the track or the nature of the competition so far this season. Meanwhile, on Friday we were right about Definitely Mamie on Jan. 14, she won and paid $13.40. Diablo Seelster was second at 5-1. AB’s Attack, a part of the favorite entry, had a miserable first half and tanked, while Whybabywhy never took a step at 40-1. On Saturday at the Big M, McClelland took his second straight, as we thought he would, at a great price, $11.80. Windsong Gorgeous was second to a 1-9 shot (a horse that won his 21st-straight race). Mark Ford’s horses, River Shark and Handsome Harry, were not productive in the Presidential divisions. At Pompano on Saturday, DVC Givemeatitude won, paying $6.40 (we liked the price). Mai Tai Guy was third, Goodnight Goodluck was off the board and Bo Bernie, an also-eligible, did not get into the race). Finally, on Saturday at Cal Expo, we liked Awesome Deal N in the first leg of the no-takout Pick 4. He was third, beaten by a horse from our watch list, Peter Hot Tail. This pacer had won once off the list, had a tough next out and then came back here and won, paying $17.20. Earlier that night, another watch-list horse, Anelectricmachine, won and paid $14.20. The standardbred press seemed shocked about the Saturday, Jan. 15 Dover card, where the public showed every flaw it could, handicapping with less aplomb than usual. This resulted in monstrous overlays, all of them explainable and all of them from strategies and observations we have made at TwinSpires since the Harness Page launched. First and foremost, we touted the talents of driver Victor Kirby over the public’s love for Tim Tetrick and Kirby continues to deliver winners worth far more than their odds. On the Jan. 15 card two of his three winners paid $23.40 and $10.40. The program before, on Thursday, Jan. 13, two of his three winners paid $23.40 and $10. Back to Saturday, where the night began with a winner paying $28.60, getting there by a neck over a 69-1 shot while the public choice was hung badly and faded. The public doesn’t realize that such tactics are available to aggressive drivers like Corey Callahan (now leading Ron Pierce in wins at the track). Next, Occasionally Bad, coming off a terrific trip, though hidden to those who look for the obvious in past performances, wins out of the 8 hole at 35-1, decisively defeating the public choice. Mind Eraser wins next and with such grace that it is impossible to say that the Brian Burton trained-and-driven mare was greatly assisted by the favorite breaking stride early. She pays $60.80. A few races later Besmitten By A Vet pays $90.60 over the public choice that can offer no excuse. A strong overland journey by Awesome Blue Jean lights up the toteboard at $21.20, Southbound Joey pays $12.80 and Drivin Miss Rudee offers $10.20. Watching trips and keeping a watch list and paying attention to the players’ side of wagering harness, which we exclusively offer at TwinSpires, are only a few ways to be ready to profit on winners as were delivered at Dover on Jan. 15. The great prices may not always come on a single card or at a single track but the arrive and you should not be so surprised. Leave that feeling to those who follow the chalk. The 2011 stakes, the Nadia Lobell for soph-filly pacers and the Moni Maker soph-filly trotters, move from The Red Mile to be raced at The Meadows. The Moni Maker will be raced on Friday, Aug. 19 and the Nadia Lobell will go on Monday, Aug. 29, with estimated purses over $200,000. There will not be eliminations; the events will be limited to the nine richest femmes of this year at time of entry. The Nadia Lobell was first raced at Garden State Park in 1990, then went to the Meadowlands in 2001. 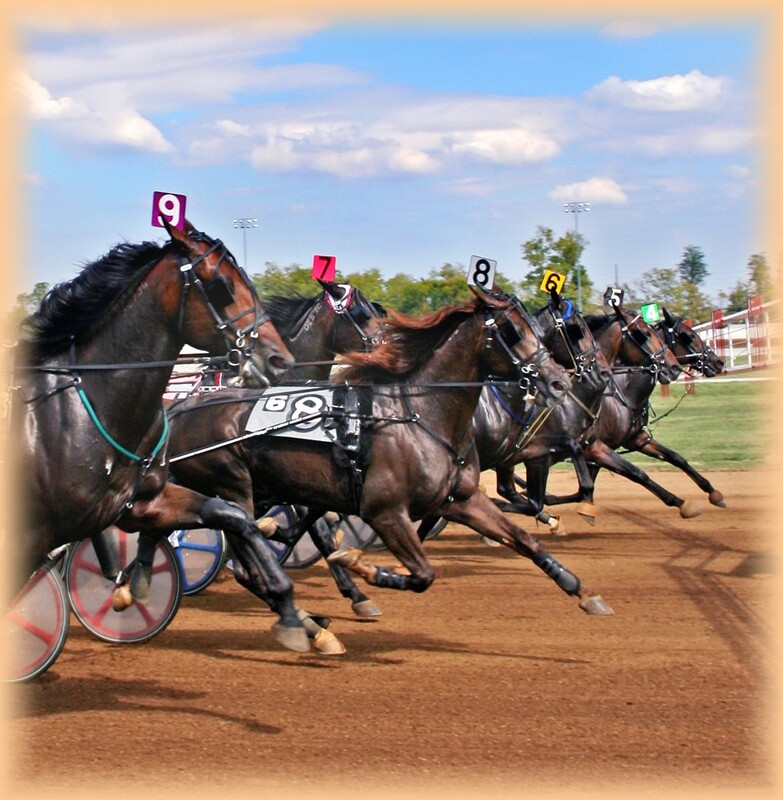 After a one-year hiatus, the race was moved to The Red Mile, which created the Moni Maker in 2005. So, for the first time in the history of the stakes, there will be three turns to negotiate. More on these races as the season ensues. Once, on a beach in Seattle — yeah, they actually have beaches there… or at least they used to; they might be Starbucks now — I tried to lie in the sun. I say “tried” because, as is often the case in the Emerald City, the sun was playing hard to get — ducking behind drifting clouds at maddeningly regular intervals (you can do that when you’re the center of the universe). And a funny thing happened whenever it disappeared: everybody that was sunbathing suddenly sat up and looked around, like groundhogs searching for… well, whatever it is that groundhogs search for. It was surreal. As it turned out, the only “say” Leave of Absence had was in how much the exacta paid, as 14-1 longshot Determinato pulled away to a handy 1 ¼-length score in Saturday’s Gulfstream Park feature. Of course, I immediately re-checked my figures to see if I had missed anything. My conclusion was that, while I whiffed on the race, my initial analysis was generally sound. 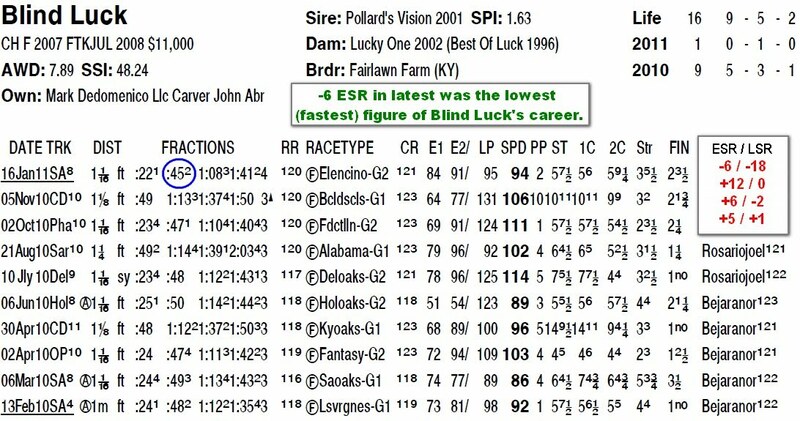 The Spectacular Bid produced horrible speed and pace numbers: an 88 Equibase speed rating (80 Beyer) and a -19 late speed ration (LSR) for the winner. That, of course, jibes with some of Determinato’s earlier figures and all but convinces me that the son of Closing Argument simply beat a weak field last weekend. In other words, my “mistake” was not that I underrated Determinato but, rather, that I overrated Leave of Absence — which is knowledge that I can use the next time some of these horses run. 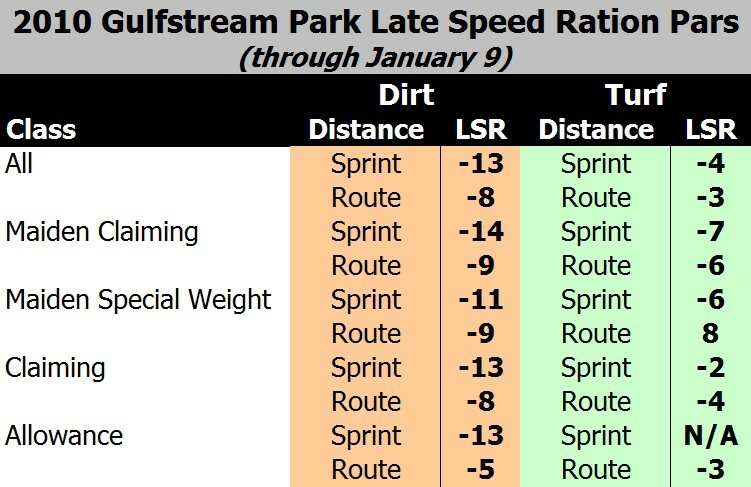 And speaking of Gulfstream Park, aided by Brisnet and a six-pack of Michelob Ultra (got to watch the carbs), I have computed the LSR pars for a variety of different races and surfaces at the current meet. What they show is that the early speed bias is still alive and well at the Hallandale, Fla. track… at least for now.